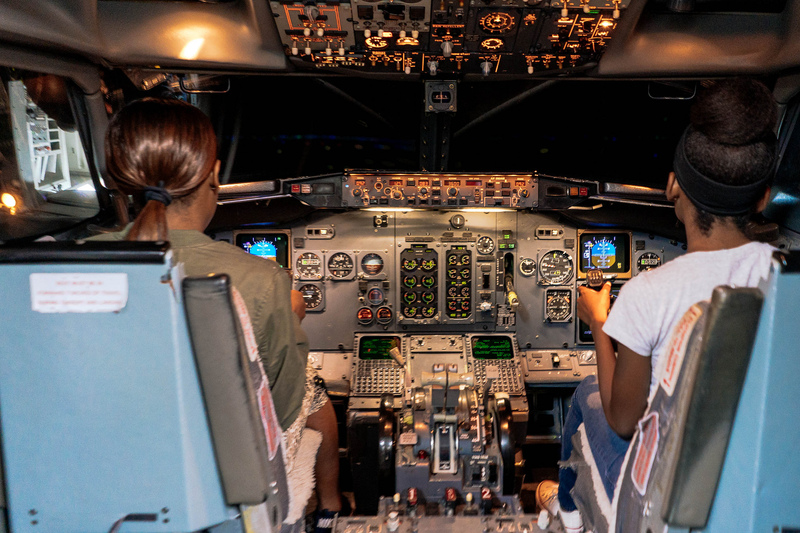 More than 50 local high school students from Miami Northwestern Senior High School, Booker T. Washington High School and Miami Edison High School got an interactive look at promising careers in aviation as part of an immersive career day at Pan Am International Flight Academy. FIU’s Education Effect and the Talent Development Network partnered with Pan Am to provide the high school students with an insider look. The students learned how to be a pilot through an immersive pilot simulation; got flight attendant training through a hands-on demonstration; and were able to direct air traffic in Pan Am’s air traffic control lab. In addition, they heard from veteran pilots and trainers who gave them insight into what a career in a high growth industry like aviation would look like. Aviation is considered one for the most rapidly growing fields. It is estimated that by 2036, more than 630,000 new airline pilots will be needed, 648,000 air service technicians will be needed, and more than 839,000 members of the cabin crew will be needed. The immersive career field trip is part of the Career Pathways Program, an intensive career readiness and paid internship program focused on building middle skills to help students succeed beyond high school graduation and become contributing members of society. As part of the program, students also are participating in a rigorous 6-week summer internships, working 20 hours-per-week with a variety of different departments at FIU and in partner corporations in Overtown. A collaboration between FIU’s Education Effect and the Talent Development Network, the program is designed to prepare and align talent with Miami Dade County’s economic development strategy and seven targeted industries, such as aviation.